Don Nottebart had a 9-year career during the 1960s. To me (having started collecting cards in 1967), he was a Cincinnati Red, but he played more seasons with the Braves and Astros. During his time in Houston he was a starting pitcher. Everywhere else, he pitched out of the bullpen. Nottebart was signed by the Milwaukee Braves in 1954. He pitched in their farm system from 1954 until midway through the 1960 season. His major-league debut came on July 1, 1960, his first of five appearances that year. Don played the entire 1961 and 1962 seasons for the Braves. He appeared in 38 games (11 starts) in 1961, and 39 games (all in relief) in 1962. In November 1962 he was traded to the Houston Colt .45s for first baseman Norm Larker. With Houston in 1963, Nottebart joined a starting rotation that included Ken Johnson, Turk Farrell, and Bob Bruce. The same four made up the rotation in 1964 also. 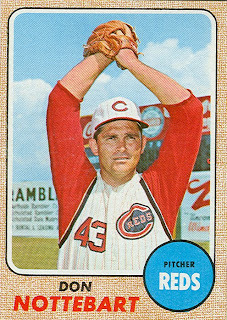 Nottebart joined the Reds' bullpen in 1966. He led the Reds' pitchers in appearances (59), while pitching 111 innings. He also picked up 11 saves. With the arrival of Ted Abernathy in 1967, Nottebart was used less (47 games - all in relief, 79 innings). Baseball-Reference.com shows that Nottebart spent all of 1968 in the minor leagues, with the White Sox' triple-A team in Hawaii. Apparently, he remained the property of the Reds, because in October 1968 the Reds sold him to the Yankees. After 4 games with the Yankees, he was returned to the Reds on April 26, 1969. The next day, the Reds traded him to the Cubs. He appeared in 16 games for the Cubs, his last on September 6th. 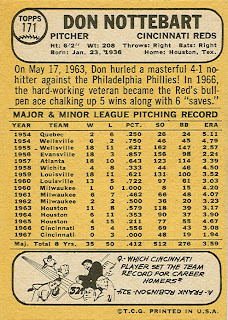 Don spent the 1970 season in the Cubs' farm system. His final baseball card was in the 1969 set.